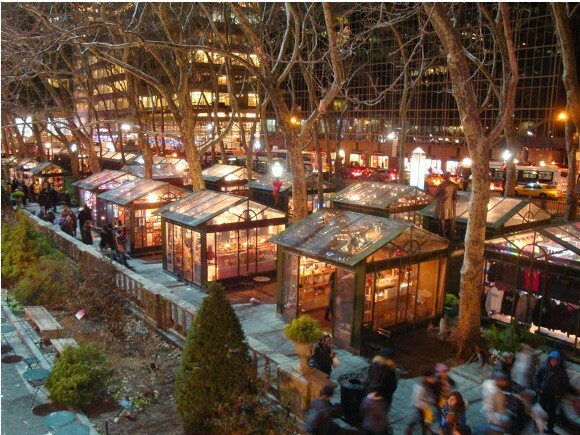 -In addition to Bryant Park Corporations offerings for Bryant Park, NYPL's Midtown campus could offer a Library-Park Recreation Model Library Parkhouse of recreation equipment to supplement the Bryant Park Collection for Bryant Park. Specialized needs recreation equipment stored here could supplement Bryant Park Corporations Offerings. 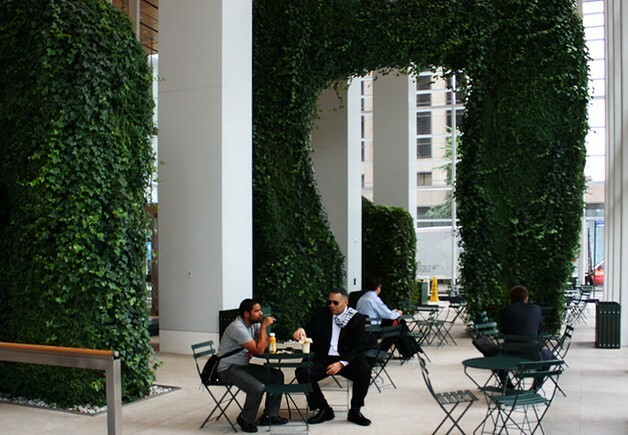 One Bryant Park Atrium is an" indoor park", that only offers seating and no other recreation amenities. 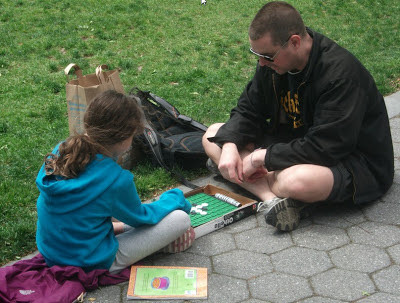 During cold momths, Chess, Scrabble and other table games could be borrowed from the NYPL Play library for use here. 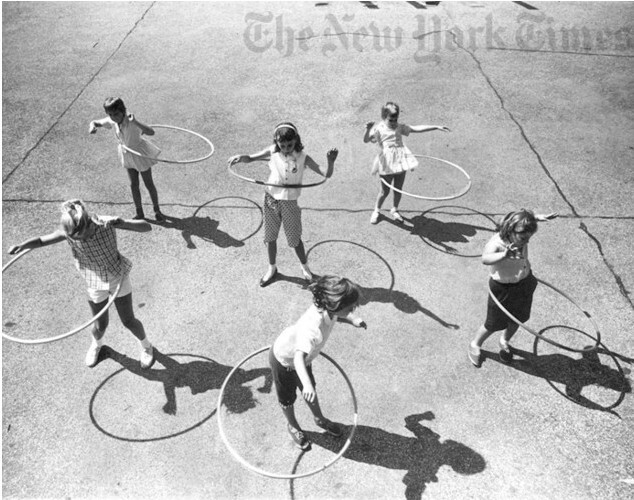 (Could one use a hula hoop or jump rope here too? good question. 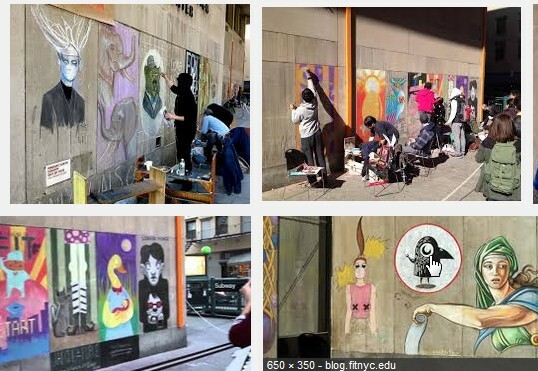 As far as I can tell except for special events programming New York City's Flatiron District offers no active recreation for its youth, adult and senior residents, nor any special needs recreation for any of its residents, workers or visitors. -offer easy access to on premise "food recreation"
You don't have to bring your own fork to a restaurant. 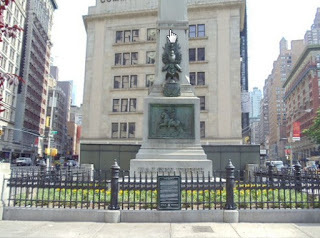 -Madison Square Park is a passive recreation park, with a lot of seating. The addition of Flatiron Plaza created an adjacent passive recreation park with still more seating.Worth Square Park is used for... more social seating. I think social seating is really great, but having all this social seating does nothing to meet CB5 community active recreation needs. . Following are several ways to add active /activities recreation to the Flatiron District so as to put Active Recreation offerings on a more equal footing with food recreation offerings. MSP, Parks Department, and Flatiron Partnership ,cooperate and jointly take responsibility for Flatiron District active recreation needs. 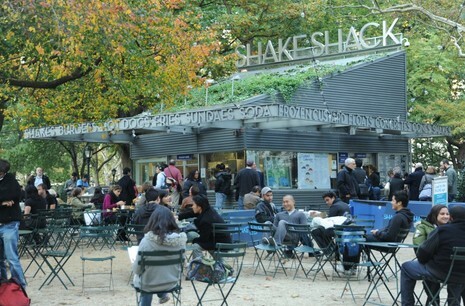 -Add a staffed active recreation parkhouse to Flatiron Plaza, jointly run and staffed by MSP, the Flatiron Partnership and NYC Parks Department. 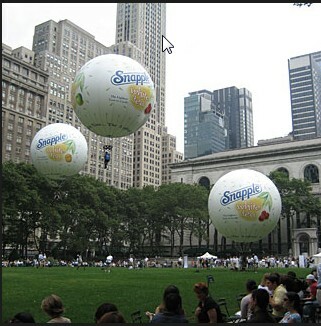 This scenario has all 3 major open space providers in the Flatiron district share responsibility for active recreation. 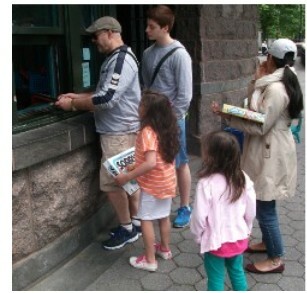 NYC Parks Department takes sole responsibility for Flatiron District active recreation needs. 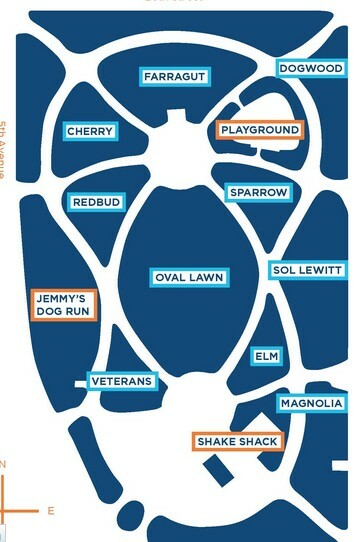 Transform Worth Square Park into CB5's first fixed equipment adult, youth, senior active recreation park with some flexible options recreation also. 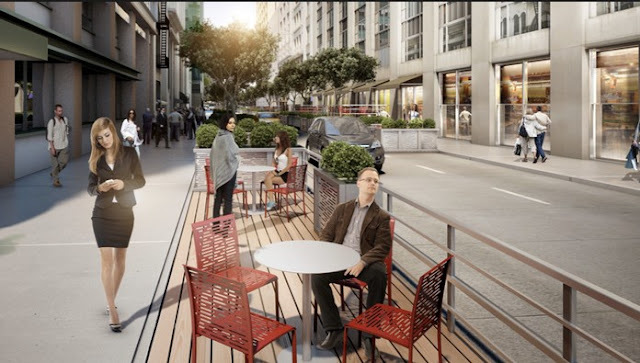 Transform Broadway in Flatiron from a place for cars to a place for people. 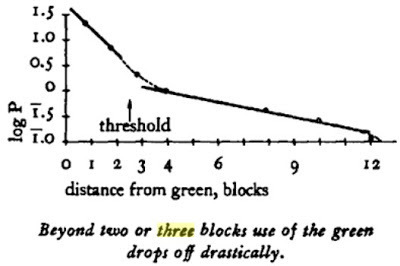 Add area to either scenario 1 or 2. 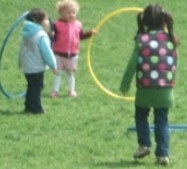 No one takes responsibility for inclusive and special needs recreation in CB5's outdoor spaces. 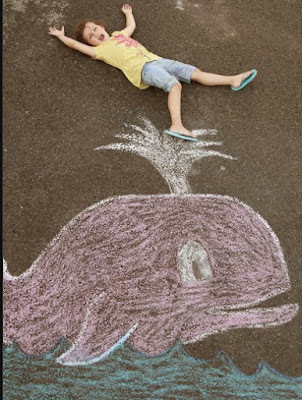 .The programming series is entitled Game On!, and will present a variety of games and activities in Water Street’s public spaces. 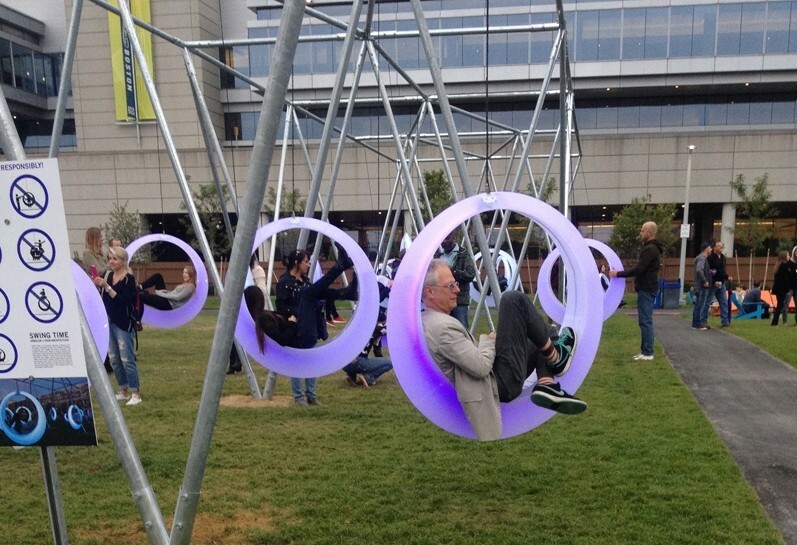 The goal of the programs is to activate these spaces to encourage the nearby commercial and residential tenant populations to utilize these areas in new, lively and fun ways. Everything from Nok Hockey and Foosball tables, giant Connect Four games, Battleship board games, traditional chalk games like hopscotch, shuffleboard and mini golf will be available. Capital Space in Washington DC gets all the public space entities in Washington planning together to cohesively plans for Washington DC's public space needs . 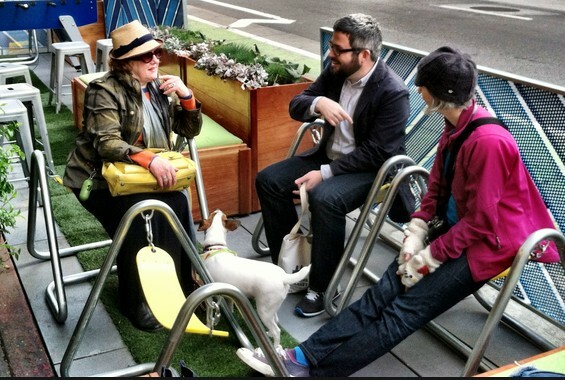 By having all open space stewards in Washington plan jointly a far more cohesive public space plan arises. 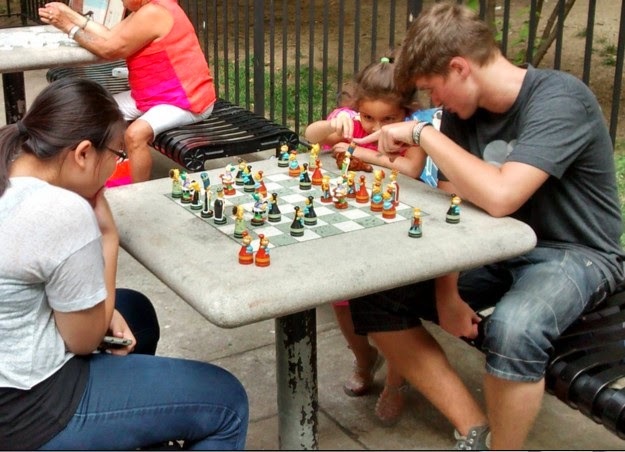 Currently there is no central planning for CB5 open spaces, so practically everybody had made the decision to offer food as recreation, and practially nobody has offered to addess active recreation needs. 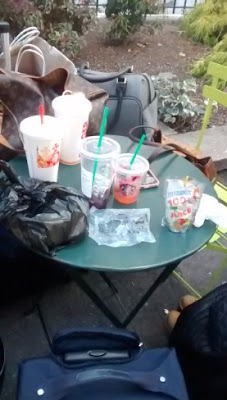 As far as I can tell Community board 5 Parks committee currently just reacts to what area public spaces come tom it with, as opposed to trying to guide area open spaces to make sure everybodys recreation needs are met, not just the people who want to sit and eat. Community boards 4 and 6 offer Basketball, Baseball and handball courts to CB5 residents. What does CB5 offer in return? 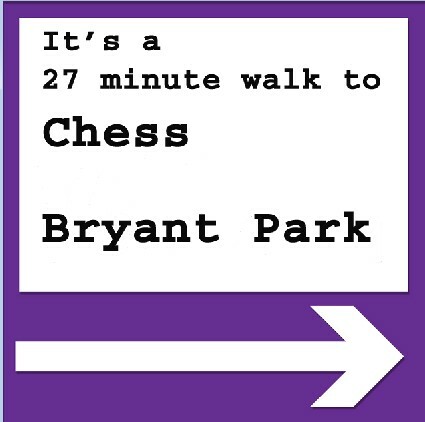 The parks department can't afford staffed facilities i CB4 and 6, Bryant Park does one of the best jobs of offering staffed facilities central to residents of 4, 5 and 6 .Flatiron Playspace and Union Square Park can by offeing parkhouses, offer staffed recreation as Bryant Park does, but as staffed parkhouse facilities do this at an affordable price.. This scenario revolves a parkhouse that lend recreation equipment being shared by MSP, WSP and Flatiron Partnership. Here is an example of such a parkhouse at Rockefeller Park ina NYS Park in Battery Park City. 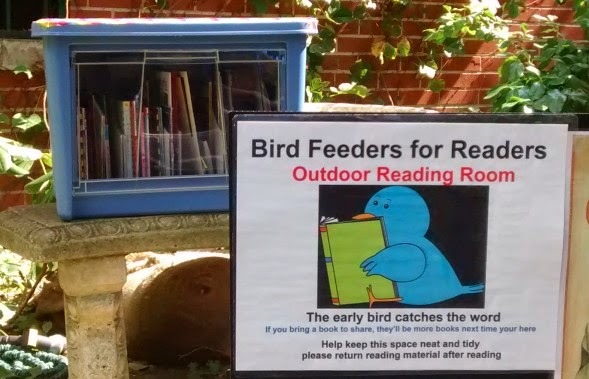 A temporary "Something for Everyone" "Library model" parkhouse where park goers of all ages and abilities can borrow equipment, can be installed for next season., so as to get some feedback on how to do one right. 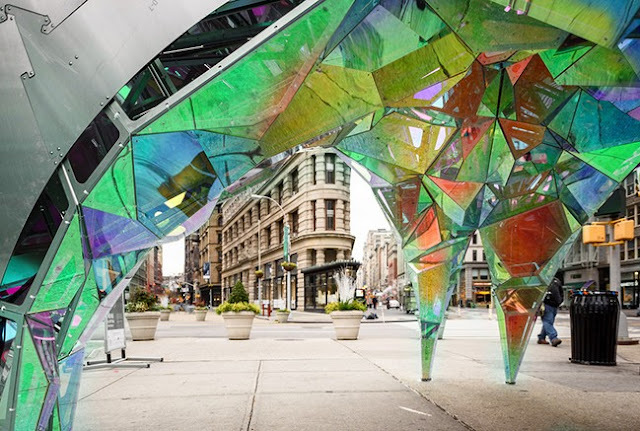 A permanent one should be part of the Flatiron Plaza redesign and be located so as to serve Flatiron Plaza, Madison Square Park and Worth Square Park . Talking to people, the issue of staffing money came up. To minimize cost, funding of staff and equipment can be shared by the 3 entities. .
One location for the parkhouse might be an underutilized location of northern Flatiron Plaza. Currently there are no inclusive playspaces in CB5. 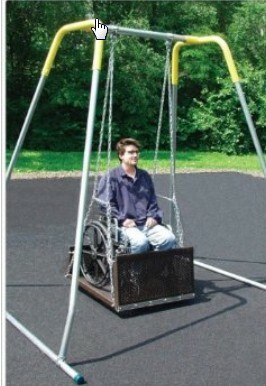 By lending equipment for both the able and disabled this parkhouse would allow CB5 to create the midtowns areas first inclusive playspace for all ages and abilities. As it turns out much "special needs” recreation equipment need not be special, they just need to be available . 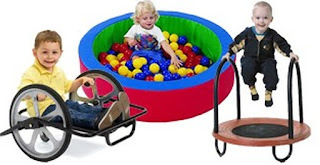 For example puppets and Lego for autism, a hula hoop for the blind , Parkinson disease, and stroke victims , Bilibo for Downs Syndrome, horse shoes for senior, reading material for people in wheelchairs, virtual reality for people of very limited movement ability. 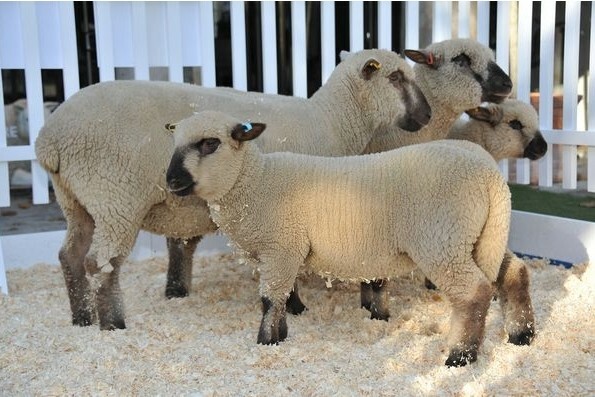 The parkhouse will offer equipment like this. Specially designed equipment for a wide range of special needs can be purchased as requested and be offered at the parkhouse. 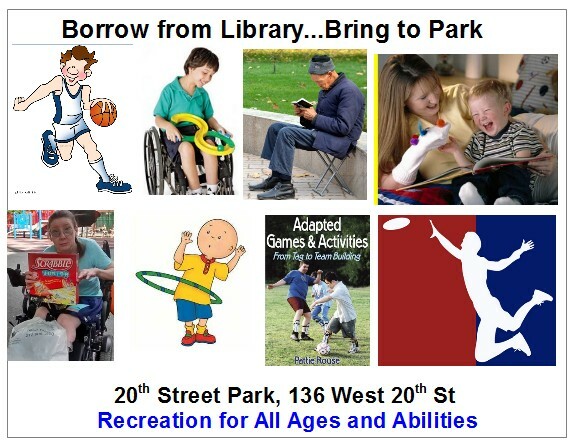 Through the use of the Library model of inclusive recreation, CB5 could fastrack the creation of CB5's first park offering special needs recreation for all CB5 residents. Worth Square Park is .27 acres (11761 feet) square feet.It could be enlarged by incorporating space from adjacent Flatiron Plaza sliver areas. Rather then have Worth Square Park continue as simply more social seating for Flatiron Plaza , or be transformed into a fixed equipment playground. , how about it becomes a full time flexible "have it your way" activities playspace that is jointly programmed by NYC Parks Department and community.members/groups. 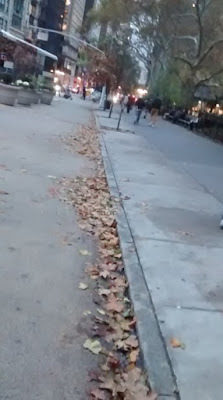 I know of no community gardens in the Flatiron area (or for that matter anywhere in Community board 5) . 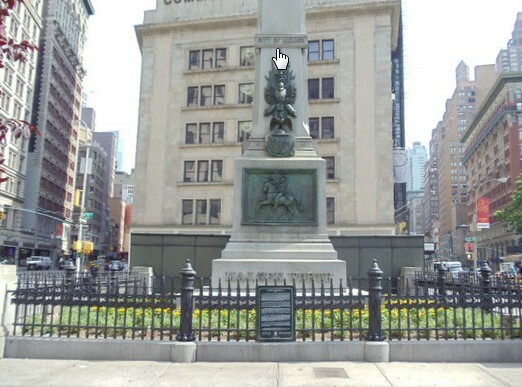 Worth Square parks planting area can become CB5's first community garden. Madison Square Park has a art program that offers parkgoers the ability to view fine art produced by artists from around the country and the world. . Flatiron Partnership also offers professional art exhibits at times. 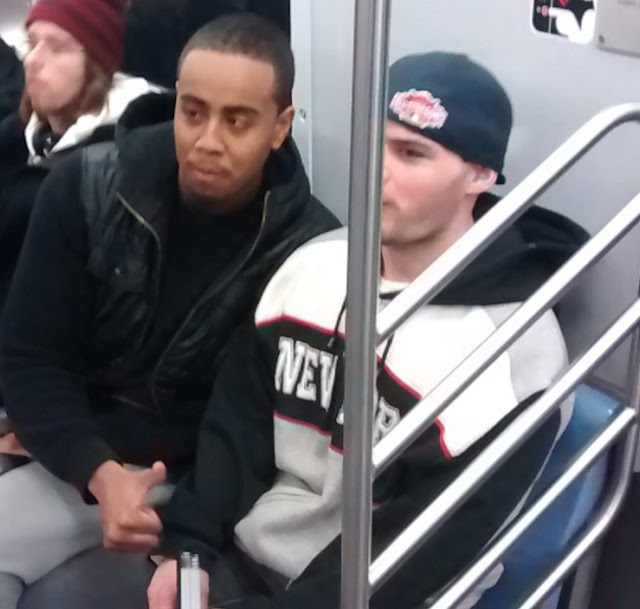 Neither of these is particularly neighborhood oriented. 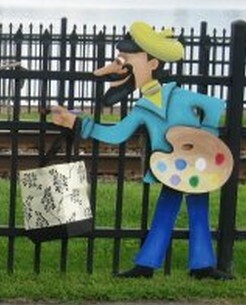 The Worth Square Park's fence , could be used for a year round community art gallery, with ever changing exhibits as chosen by people who live and work around the area. 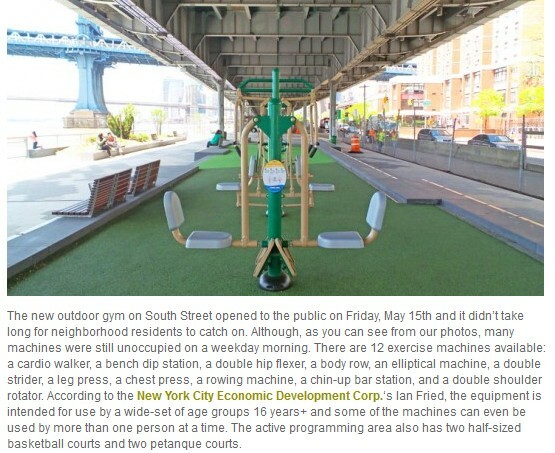 FIT is located a few blocks from Worth Street Park (26th St and 7th Ave) . 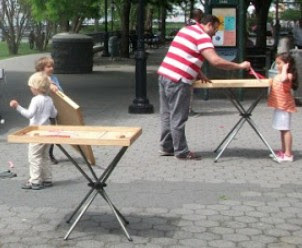 I talked with FIT students and they are interested to have a neighborhood public space to exhibit their works..
. 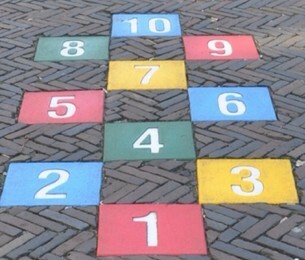 It can have embedded Hopscotch, skully, a maze ,and other sidewalk activities build into the sidewalk. 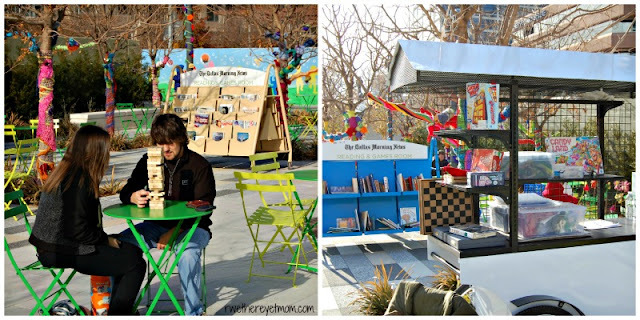 A portable Reading room in Worth Square Park would be keeping with the flexible equipment idea. This can function as a storage room for larger equipment. 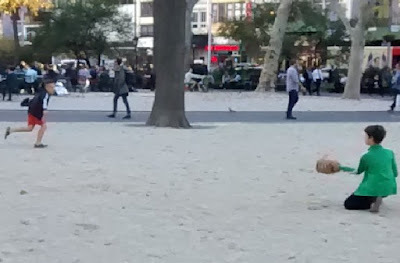 The current Madison Square Park Playground seems to be oriented towards very young children, , Worth Square Park can serve older kids, adults and seniors with loose parts, and movable equipment play. 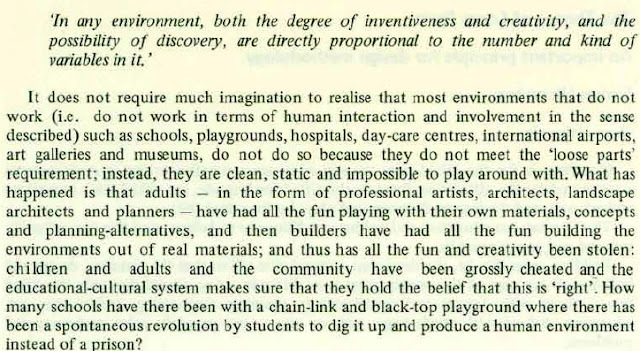 RMIT University researcher Brendon Hyndman found the children were more inclusive when they played with everyday objects, compared to times when they used conventional playgrounds. 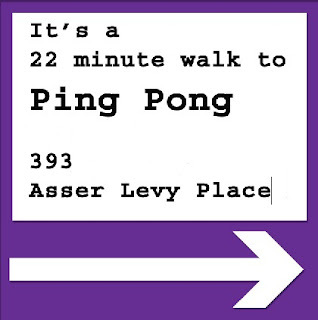 Nok hockey, Foosball and possibly ping pong tables can be stored in the Worth Street Park storage room (or Flatiron Playspace parkhouse) and setup at Worth Street Park. With the installation of a parkhouse, family friendly active and activities recreation options could flourish in the Flatiron Playspace, as they have in Rockefeller Park. . 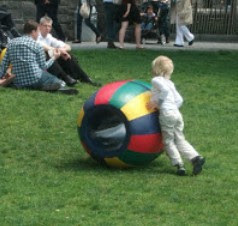 It will be years before a new childrens play area is built in Madison Square Park. 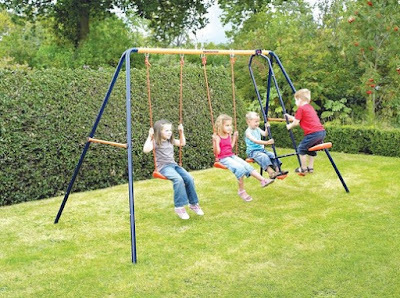 Until then, there is an area just across from the childrens playground that can be used as a full time unsupervised childens free play area.. I brought a petition to the playground about this concept, and most of the nannies and parents I spoke to signed the petition. Rockefeller Park has such an area, which is unsupervised, As far as I know the grassy area at Rockefeller Park is available 7 days a week. To mitigate any concerns MSP has over their grass, the loose parts play area can rotate between areas, such as, Sparrow and Cherry so as to allow the grass to rest. 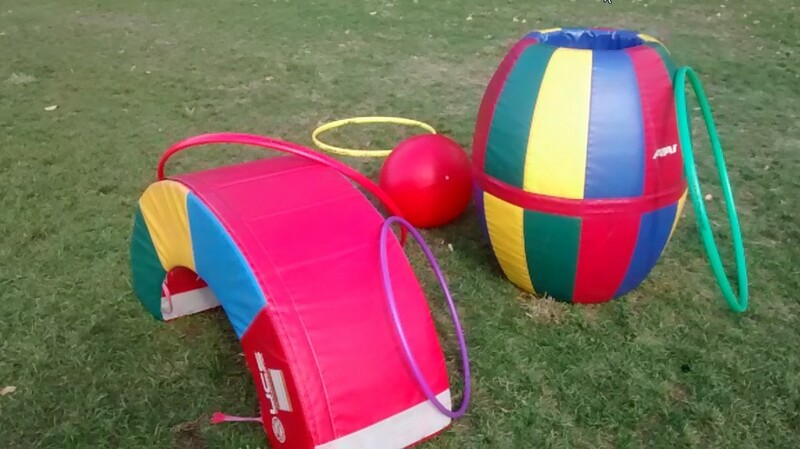 Equipment for all areas will be available from the Flatiron Playspace parkhouse. In most locations, Citybikes are stored in a linear fashion. 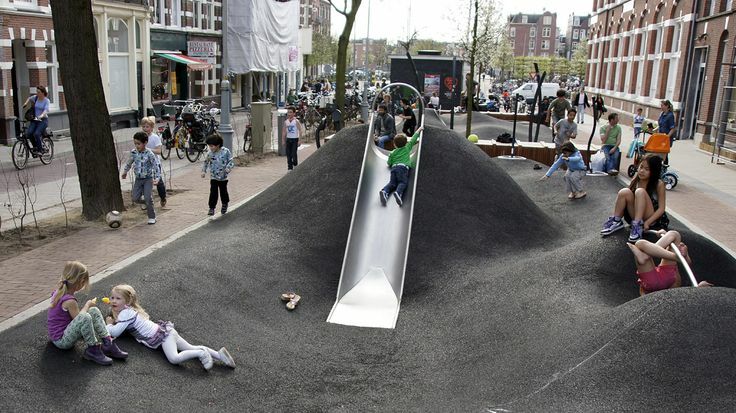 The Flatiron Plaza North Citybike island area would be far more valuable as playspace. Move the bikes elsewhere to a street or sidewalk. 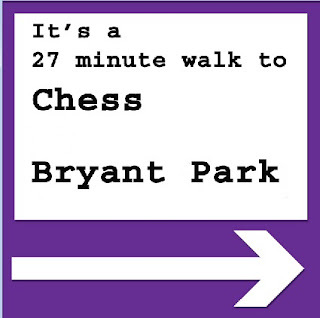 , One though for the area is for a dedicated chess, checkers and other table games area. 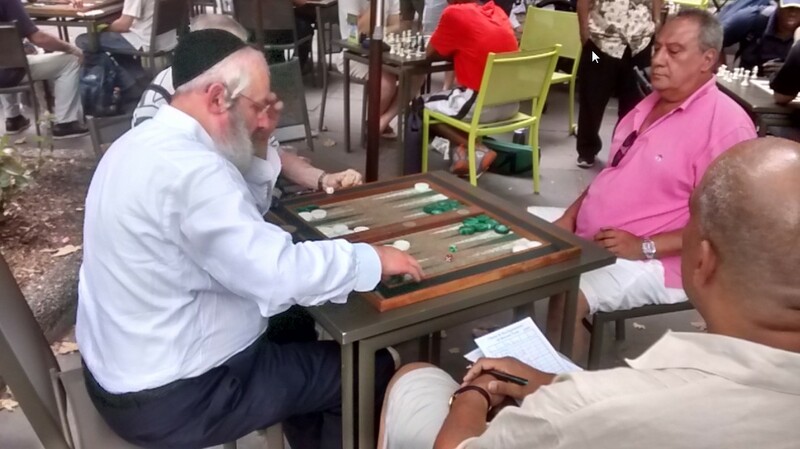 The dedicated table games area at Bryant Park, attracts hundreds of people every day. 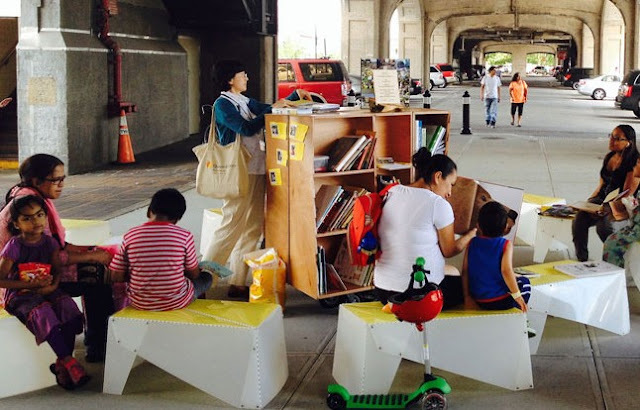 One or more little free libraries for all ages can be in the Flatiron Playspace. Worth Squares will be portable. Other ones may be fixed in nature. 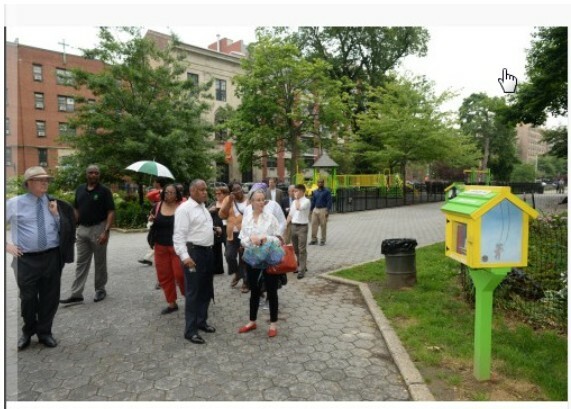 Shown below, Parks Commissioner Michell Silver at a Little Free Library in Marcus Garvey Park. 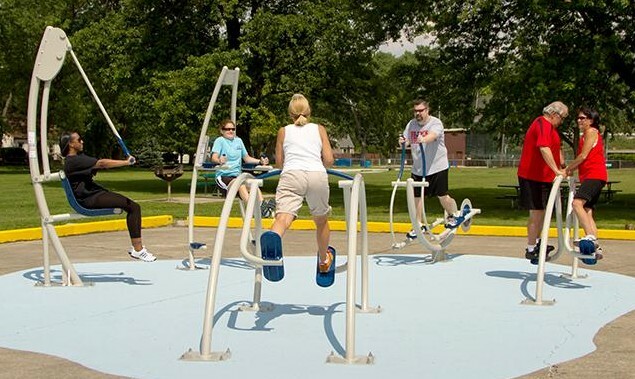 Rather then having to place fixed exercise equipment in places like Worth Square Park, There are alternative location for them that will fit "sliver spaces"
On the western edge of MSP equipment like exercise bikes, foosball tables, senior exercise equipment. 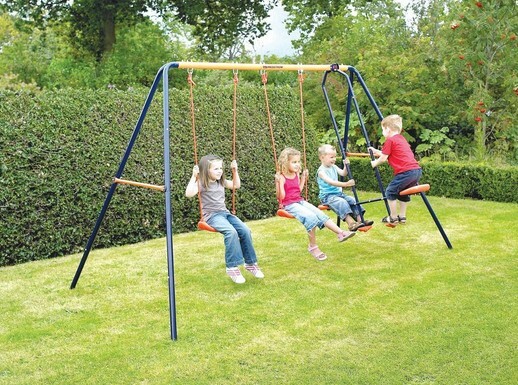 swings and handicapped swings can be placed (swings would face north south) in a linear fashion. 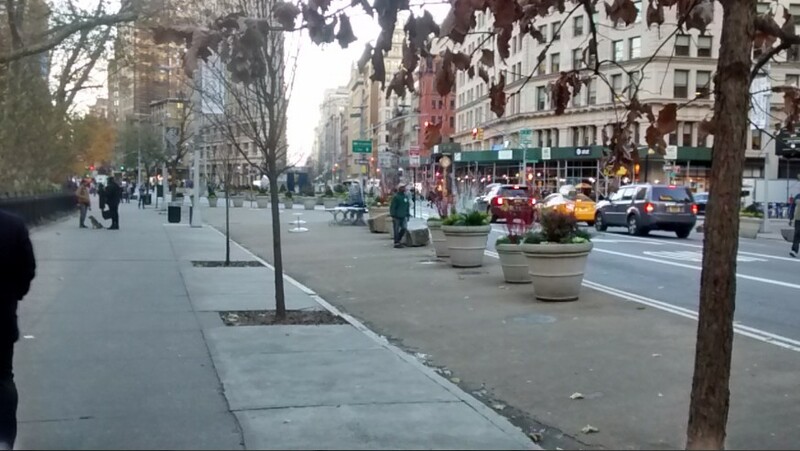 Currently Madison Square Park offers mostly passive recreation bench seating, and and 2 areas with social recreation seating . 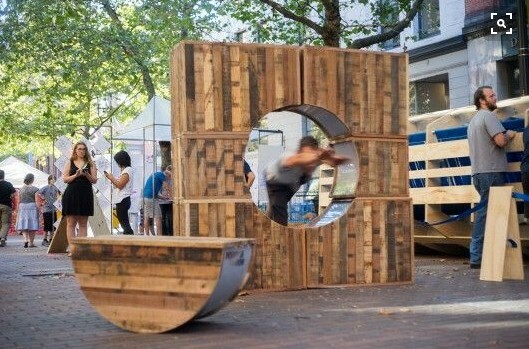 How about adding activities and active recreation seating to their seating mix? 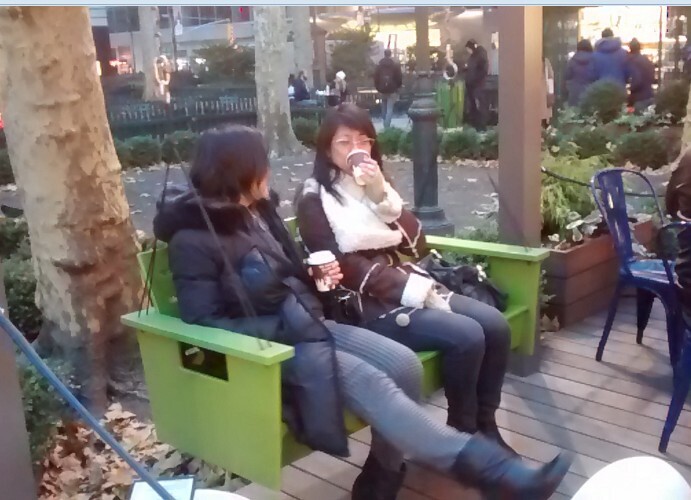 One thought replace some of the benches on the Madison Avenue perimeter of Madison Square Park with swing seats. 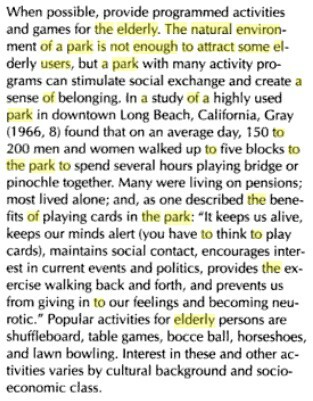 A second idea is that passive recreation benches are actually active recreation benches-if only people were given an instruction book. 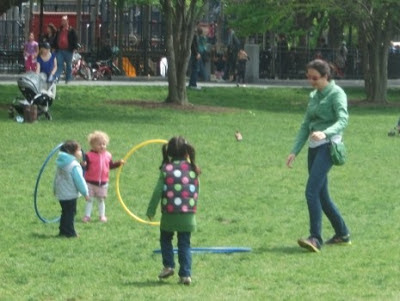 -Transform the 11,000 square foot Worth Square Park into Broadway Playspace CB5's first neighborhood fixed equipment active recreation park. At 11,0000 sq feet Worth Square is pretty small. How about incorporating parts of the northern tip of the plaza area to create a larger park. 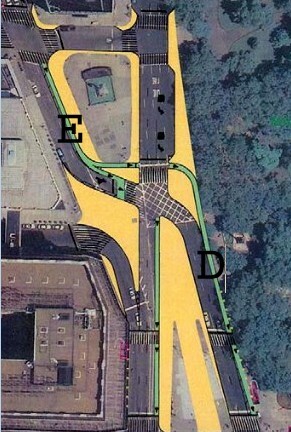 - Add North Eastern tip sliver spaces(C) of Flatiron Plaza to Worth Square Playspace this will include part of adjacent sidewalk. Area B will become table games area, outdoor reading room area. No food. 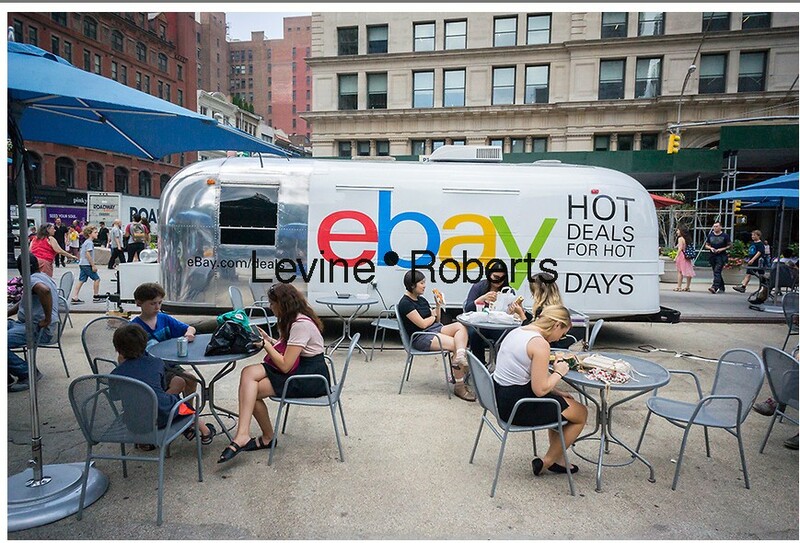 For people who want to play and eat they should take equipment to Flatiron Plaza. 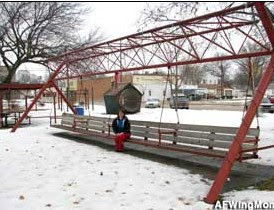 Area C will become area for fixed equipment and swings. 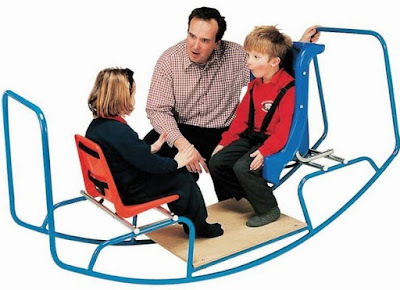 Tandem rocker for people with autism . I suspect this will be fun for everyone. In addition to the C street space and its adjacent sidewalk , perhaps some benches can be removed, and replaced by active recreation equipment. The Worth Monument shed will be used as a storage shed for movable equipment, that can be swapped into the park by parks department maintenance employees. . I mentioed a whole bunch of items for Worth in the Flatiron Playspace Scenario, , many can be done here too. None of these are expensive. 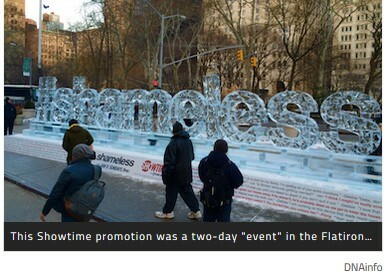 Perhaps parks can fund this on their own, if not. 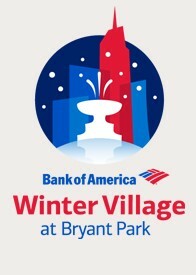 I was at Bryant Park and saw how they funded their winter ice skating rink- with a sponorship by Bank of America. Worth Square Playspace could be expense funded by offering sponsorship rights, to either a toy related organization, or perhaps a bank. 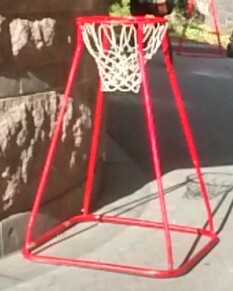 -Build a bunch of great lookiing active recreation items and/or interactive items like this. 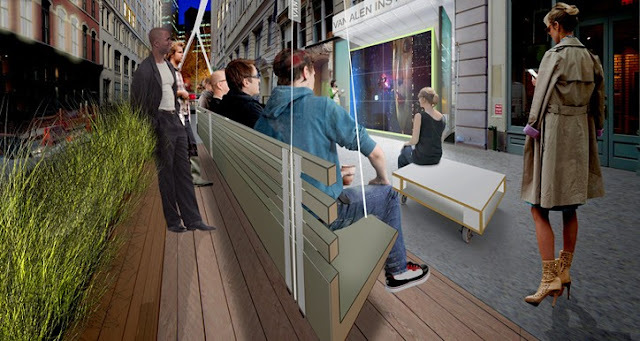 Populate Broadway Playspace between 23-24th st. with them. -Add a new pieces every year(this piece was part of a Flatiron Partnership yearly competition). By asking that the new added southern Broadway Space is to be used as part of a community playspace as opposed to a space for more food recreation/commercial/junk marketing. both the Flatiron Partnership merchants and the community will benefit. 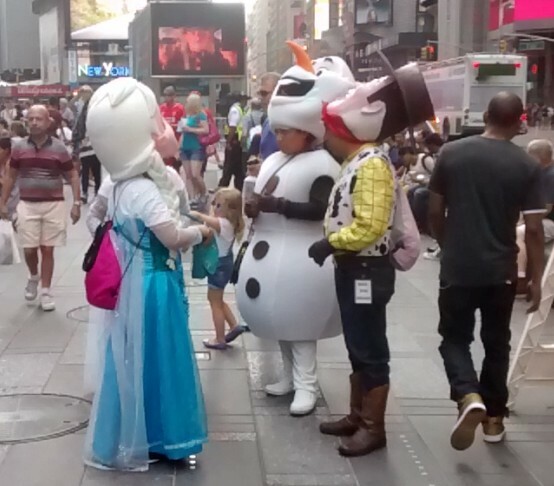 The community gets more playspace , the merchants of the Flatiron district, get a child friendly tourist draw attraction to draw people to the district. Contrast this idea to Times Square Plaza. In Times Square the BID has offered nothing of interest to kids and families. So what has occurred is private merchants have moved in to do the job. 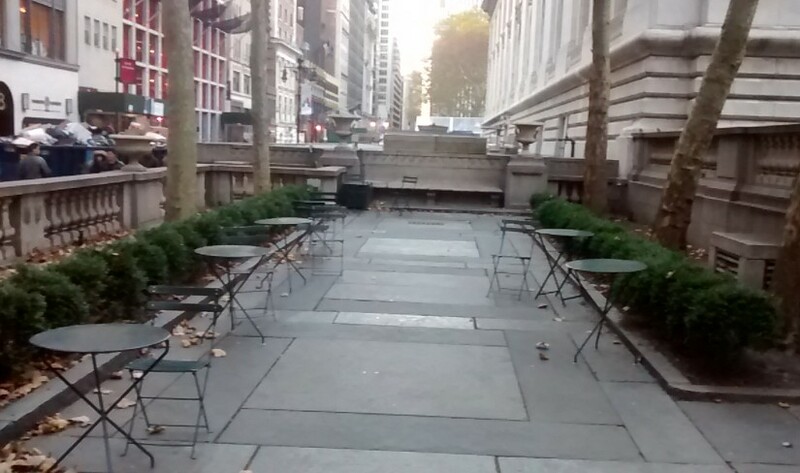 Currently there is social seating here, a citybike station, and a plaza eatery. I think this area will be redesigned to be more of the same. 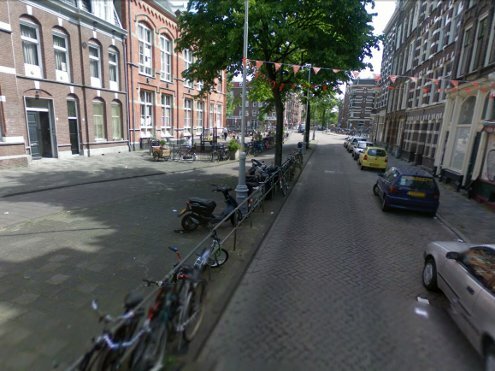 Land like this is too valuable for a citybike station,. The citybike station can be moved onto an adjacent sidewalk. Rather then just the same old plaza, how can this space be converted into something that can also meet neighborhood active recreation needs? 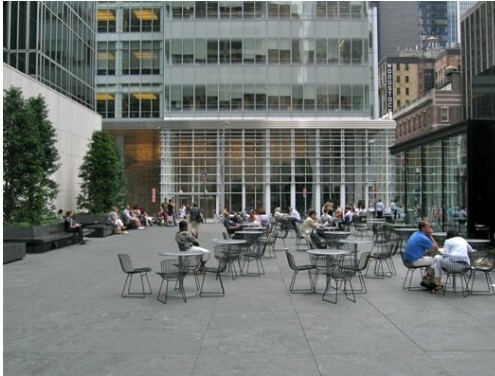 Currently fixed seating benches and social seating tables and chairs are offered here. 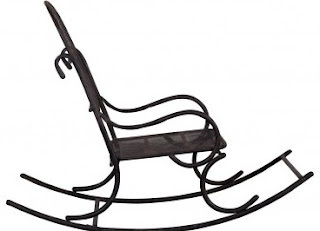 How about adding recreation seating to the mix. 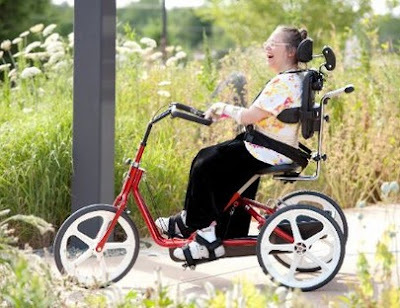 Business as usual.. No outdoor space in the Flatiron District takes responsibility for youth, senior, adult, inclusive and special needs active recreation in Flatirons outdoor spaces. 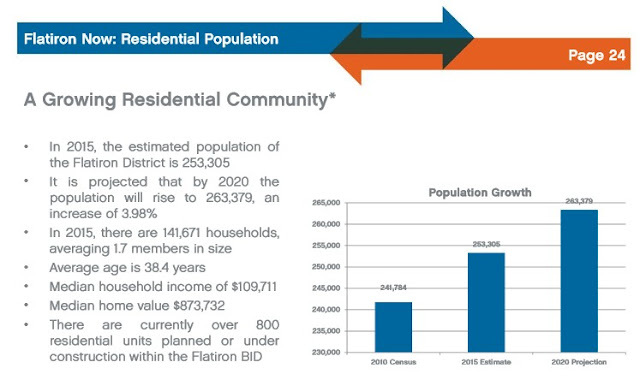 Community boards 4 and 6 continue to take responsibility for Flatiron district and CB5 youth, adult, senior active recreation needs. 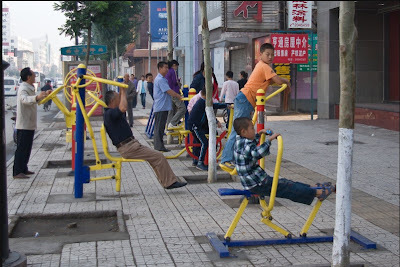 This is kind of like Newark providing Hobokens active recreation. 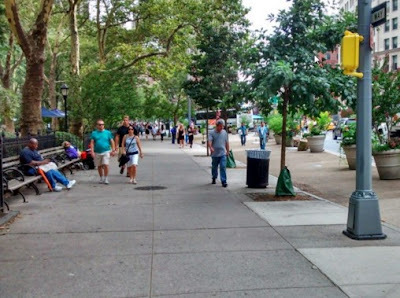 As part of the Flatiron Plaza upgrade, in place of adding active recreation to CB5, DOT could be requested to add signage throughout the Flatiron District with directions to active and activities recreation parks that are located in community boards 4 and 6. 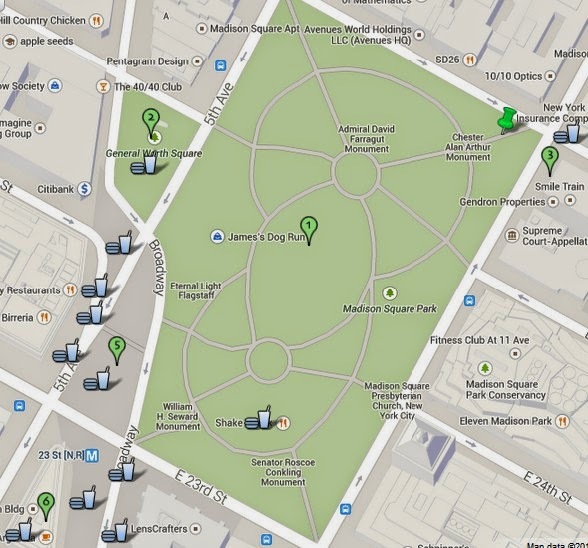 Also they can add signage for directions to Bryant Park. I am kidding about posting these signs, Hopefully they have helped made my point. Twenty minutes is too far. As this chart shows after 3 blocks (3 minutes) use of a park decreases drastically. The chart is for a passive recreation park, but active recreation usage just as surely decreases as distance increases. If we looked at the number of people in CB5 who use the parks of VB4 and 6 I suspect it it would be pretty slim. 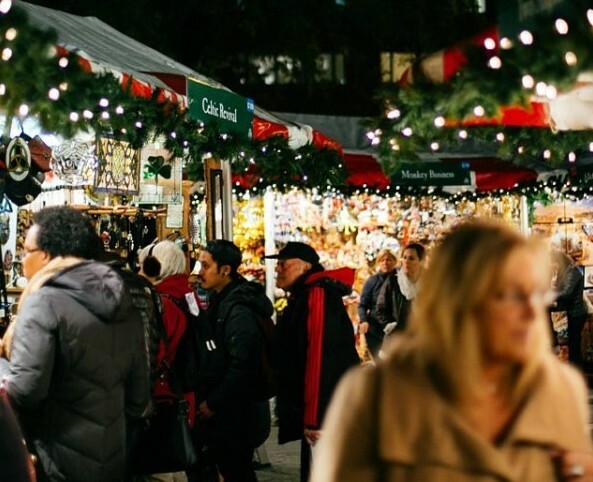 Attention neighborhood foodists: it’s your favorite time of year! Mad. Sq. 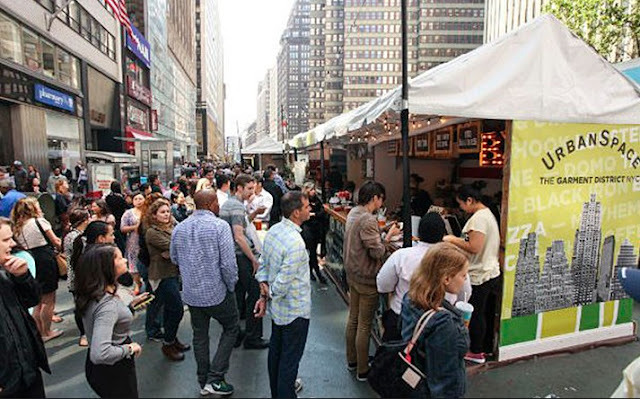 Eats is returning to Worth Square Friday, September 21!! 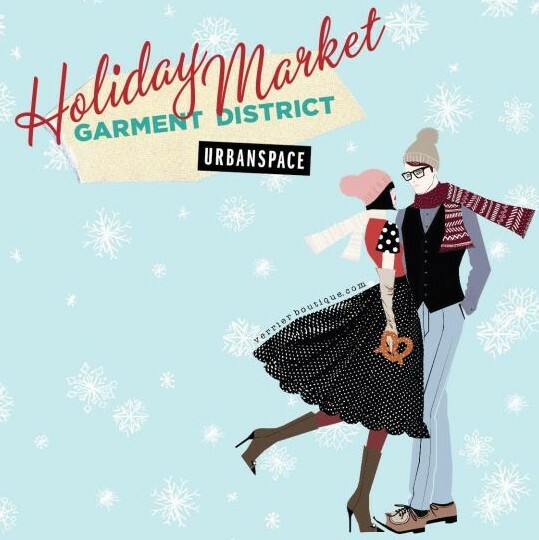 This month-long outdoor market will bring you 26 vendors from some of the city’s most raved about eateries, including returning Mad. Sq. Eats favorites as well as some newbies to keep things feeling fresh. All are welcome to stop on by, grab a drink and EAT! Mad. Sq. 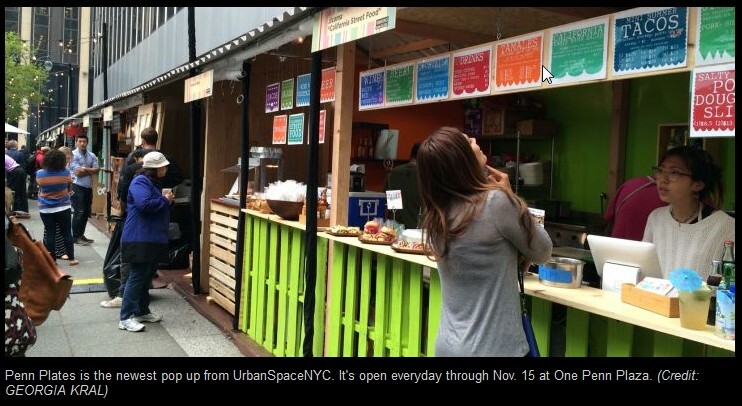 Eats is open daily September 21 through October 19 from 11am to 9pm. With the extensive line-up of vendors, be sure to stop by early and often and try it all! 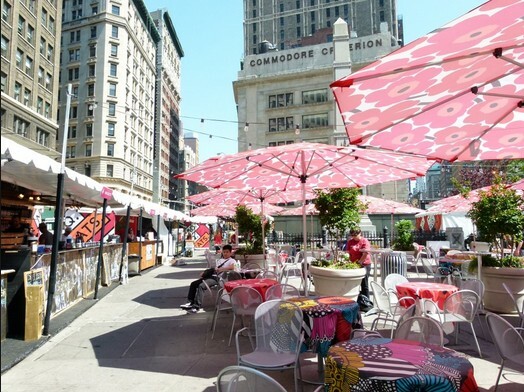 Worth Square is located directly adjacent to Madison Square Park on the intersection of Broadway, 5th Avenue, and 25th Street – you can’t miss the vibrant umbrellas and tablecloths! Clayton Smith, chair of Community Board 5's Parks and Public Spaces committee, said companies' installations take the pedestrian plazas away from the public. "Product launches and commercial events deny the public that space and disrupt daily life for residents and businesses," Smith said. "It's inconvenient, it's in the way and it's cynical." "Oh, I can't walk through this public space because it's been rented to a corporation," he said he thinks while navigating the advertising. The primary mission of the parks department is to create parks that serve the needs of the community. Unfortunately due to budget constraints, (plenty of capital budget, no staff budget) they are not always able to carry out their mission as best as they can. The primary mission of many parks and plazas run by BIDS/Conservancies in many instances seems to be to serve commercial interests, and/or to offer activities that will generate the funds to pay for their spaces. 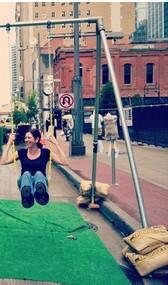 Based on who gets control over any new Broadway areas, Flatiron will get two very different experiences. Only one of them will serve the active recreation needs of the community. For example, Union Square park offers a playground for little kids, , seating for older people, a dog run, food as recreation (The Pavilion) shopping as recreation (Union Square Holiday Market) It is inclusive for people who want these features, It subtly excludes use by ping pong players, the disabled who are offered no equipment of interest(wheel chair swings, audible balls etc) ,, youth who would like to play foosball. etc, etc etc Can these groups still go to Union Square Park? Yes, but many do not bother as the park does not offer recreation opportunities that interested them. I've no doubt that the Flatiron Plaza upgrade plan will meet ADA standards, I strongly doubt the organizations involved are creating activities at the space that will allow everyone to feel included, no matter what their ages or abilities. .
People don't generally talk to strangers in public spaces. 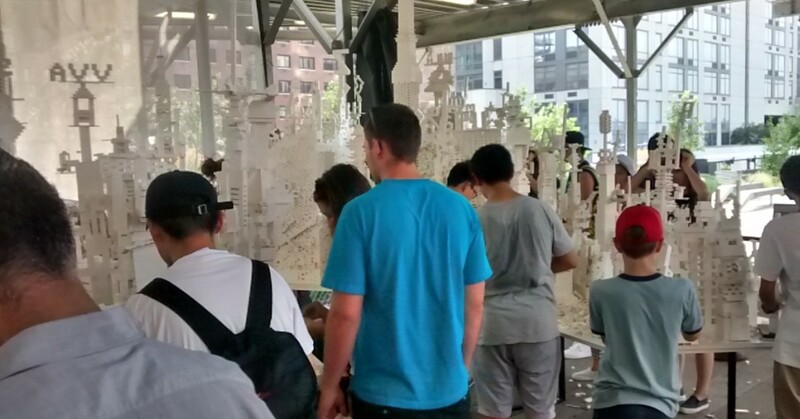 Have one bench or table in the Flatiron Playspace with a sign " talk to me" and an explanation of the concept. . 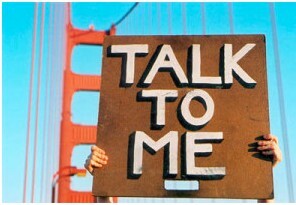 If you are sitting there, it means you want people to talk to you. . The Bryant Park table games area creates a space where people of all ages come regularly and meet to play games. Just as important as the games are the relationships you build over time with the other regular players. 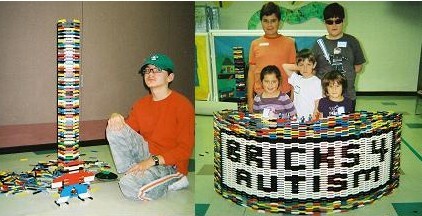 Creating ongoing spaces that allow relationships to be built over time is important. 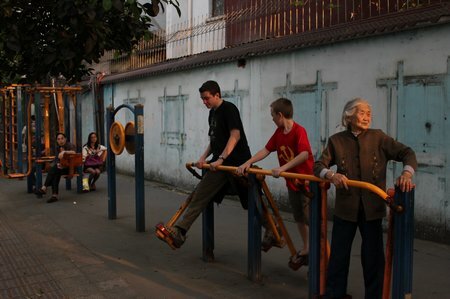 Brtyant Park Games is really a community center open to people of all ages. Note-When I first visited the Bryant Park Table games area, 1 person was there using it, yoday a lot of people use it, it took them several years to work out how to get it going. As things are set up now. Flatiron Partnership and Madison Square Park, officials "program" their spaces. through the vision of their professional staff. That's why we have no daily active, activities, senior, or special needs recreation in the Flatiron District. 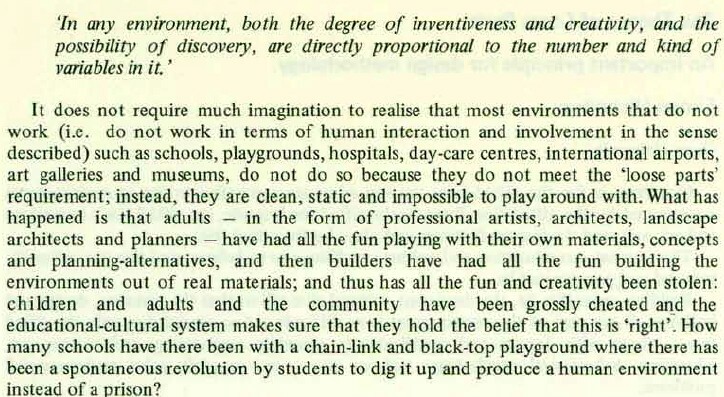 The loose parts parkhouse concept is meant to be "programmed" by the community. 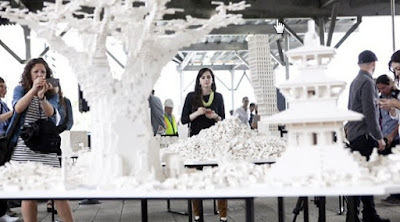 with far less "visioning" from the professional staffs.